HNTB-designed Colorado Street Bridge celebrated by Pasadena Heritage The bridge engineering firm of Waddell & Harrington — a forerunner to HNTB Corporation which this year celebrates its 100th anniversary — designed the Colorado Street Bridge dedicated in 1913. 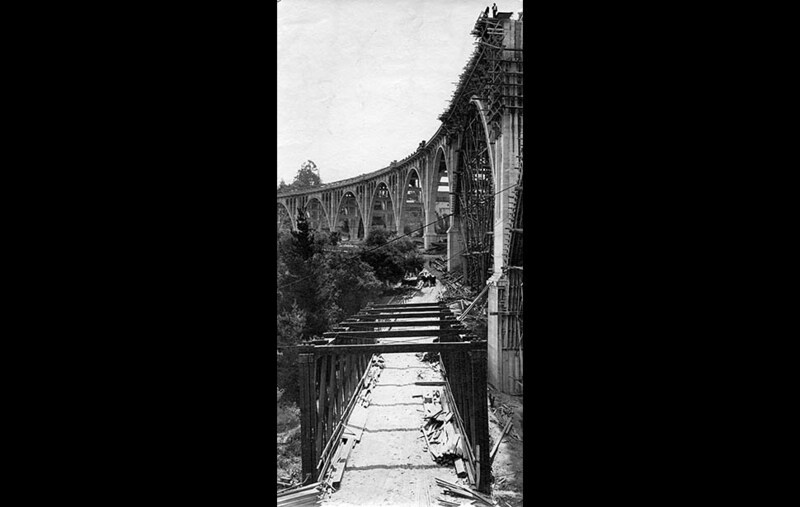 This 101-year old landmark is being celebrated by Pasadena Heritage on July 12, 2014 with its signature Colorado Street Bridge party which draws local officials, business leaders, sponsor partners and thousands of residents for a festive evening on the bridge. “As part of HNTB’s 100th anniversary activities, we are honored to be a part of this exciting event for the Colorado Street Bridge, which was our company’s first design project in Southern California,” said Vic Martinez, PE, vice president and Southern California District Leader. 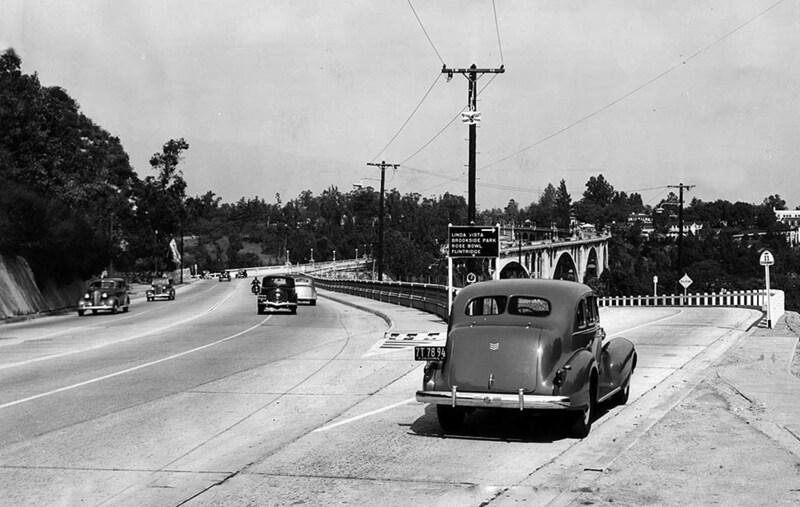 The landmark structure, also referred to as the Arroyo-Seco Viaduct, carries Colorado Boulevard (then called “Colorado Street”), the major east-west thoroughfare connecting Pasadena with Eagle Rock and Glendale to the west, and with Monrovia to the east. It spans 1,486 feet and is notable for its distinctive Beaux Arts arches, light standards and railings. 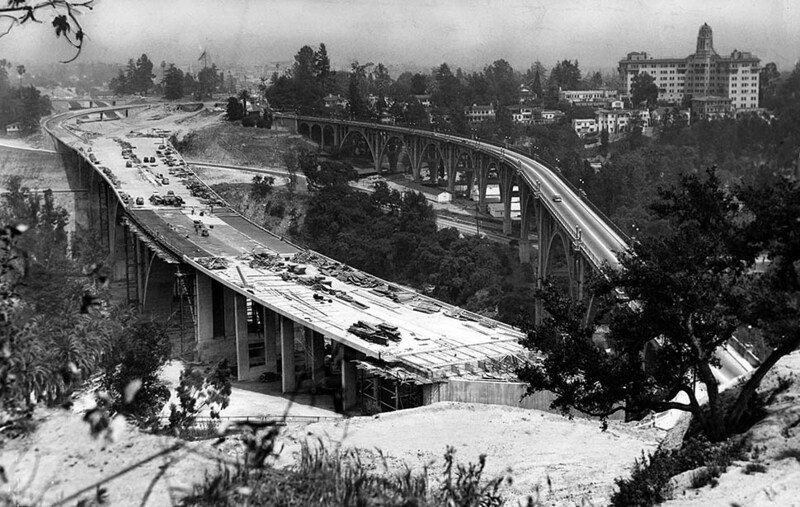 The concrete bridge is on the National Register of Historic Places and has been designated a National Historic Civil Engineering Landmark by the American Society of Civil Engineers.A century later, HNTB was selected by the City of Los Angeles to design the new Sixth Street Viaduct, which includes a modern interpretation of arches that echo and respect the original bridge. In Southern California, HNTB has been involved in some of the region’s most high-profile, complex infrastructure programs that are reshaping the region. In addition to the Sixth Street Viaduct Replacement Project, HNTB is providing lead design and engineering services for the Crenshaw/LAX Transit Project on behalf of the Los Angeles County Metropolitan Transportation Authority, and the Tom Bradley International Terminal Expansion for Los Angeles World Airports. Most people may not know that the 101-year old historic Colorado Street Bridge in Pasadena was designed by a small bridge engineering firm (now HNTB Corporation) from Kansas City that this year is also celebrating its 100th anniversary. This landmark bridge was HNTB’s first project Southern California and today they are designing the 6th Street Viaduct, among other major infrastructure projects.The Pasadena Heritage is hosting its signature Colorado Street Bridge Party on July 12, 2014 from 6-11 pm on the bridge for the community with music, food, local officials, entertainment and brief program. HNTB Corporation is an employee-owned infrastructure solutions firm serving public and private owners and contractors. HNTB’s work in California dates back to its founding in 1914. Today HNTB continues to grow in size and service offerings to clients in California from seven office locations, currently employing more than 350 full-time professionals. Now celebrating a century of service, HNTB understands the life cycle of infrastructure and addresses clients’ most complex technical, financial and operational challenges. Professionals nationwide deliver a full range of infrastructure-related services, including award-winning planning, design, program delivery and construction management. For more information, visit www.hntb.com.